As a big fan of the Food Network it was great to meet Tyler Florence in the Oscar Mayer event in New York City a few weeks ago (watch the video interview with Tyler Florence). However, the person who made even a bigger impact was a Wienermobile driver Brian. Did you know that every year thousands of college graduates get to apply to be an official Wienermobile driver and only the best of the best will be approved? Neither did I. Bryan tells it all what it takes to be a Wienermobile driver, and how he lives life to the fullest driving around the most famous wiener of them all. A must see video – shot directly inside the Wienermobile!! You can also follow and chat with the @Wienermobile crew on Twitter. 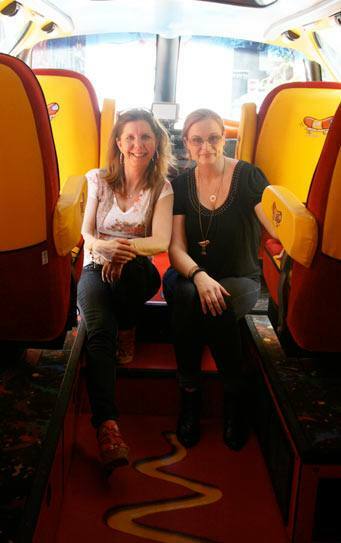 Special thanks to my friend Rachel Ferrucci who filmed the video – and here is a picture of Rachel and I inside the Wienermobile.